Operation Khukri was a daring rescue mission conducted by the Para Commandos in Sierra Leone,June 2000. 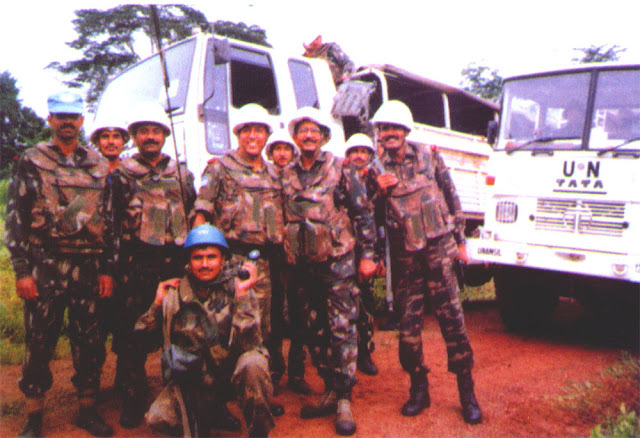 The mission was a total success which resulted in safe rescue of all the hostages where Indian and Nepali troops were part of a multinational UN peacekeeping force. About 120 Special Force operators commanded by Major (now Lt. Col.) Harinder Sood were airlifted from New Delhi to spearhead the mission to rescue 223 men of the 5/8 Nepali Gorkha Rifles who were surrounded and held captive by the Revolutionary United Front (RUF) rebels for over 75 days. The operation, involving Mi-25/35 helicopter gun ships of the Indian Air Force and other infantry battalions, was a complete success with no Indian and Nepali casualties other than a few shrapnel wounds. The Special Air Service who were present as part of the British force, loaned the Para Commandos their Chinook transport helicopters for the initial assault. Immediately after the release of the 21 Indian soldiers from their camp at Kuiva, the UN set in motion a plan to rescue the two companies of the 5/8 Indian Gurkha Rifles (Mechanized Company-1 and Motorised Rifle Company-1), surrounded at Kailahun. The company commanders were able to talk regularly with their commanders back at base, and before the assault were given the broad outline of the plan along with their duties. The forces involved would include the Indian QRC (troops of 5/8GR, 14 Mechanised Infantry, 23 Mechanised , and 9 PARA (SF)), a company from 2 PARA (SF). Support was to be provided by Indian Mi-8s, Chetaks, and Mi-35s, two companies of African troops (one each from Ghana and Nigeria), and RAF Chinook C.1 helicopters. Against this force was a battle-hardened but utterly undisciplined RUF rag-tag force armed with AK-47s, RPG-7s, and MANPADs. Phase I of the operation Khukri began on the 13th of July with the deployment of the combat elements from their bases in Freetown and Hastings to Kenema and Daru. The movement phase was conducted using Indian Air Force (IAF) Mi-8s and Mi-26s, as well as RAF Chinooks and a Hercules C.1 transports. By the evening of the 14th, the first phase was complete and all forces in their designated positions. At dawn on the 15 July, two helicopters landing site outside of Kailahun was sanitized by forces in place there. At 0615hrs, two RAF Chinook helicopters, guided by SAS troops who had been monitoring rebel forces since some time, landed two kilometres south of Kailahun and dropped off soldiers from 2 PARA (SF) to take care of any RUF fighters that decided to contest the breakout. The Chinooks carried on to Kailahun and at 0620hrs landed and extracted 33 personnel suffering from illness, as well as eleven Military Observers, plus different stores and flew them back to Freetown. Once the Chinooks had departed, the two Kailahun companies began their assault on the town, supported by rocket launchers and 51mm mortar fire that lasted ten minutes. Mech-1 captured the town square, to be used as the Forming Up Place (FUP), and Mot-1 an RUF checkpoint on the road from Kailahun to Daru. Mot-1 took heavy fire from the checkpoint but they quickly assaulted the position and secured it. At this time the column departed the town with Ghatak (Commando) Platoon in the lead. At 0730hrs the Daru, column (5/8GR) moved out, having been relieved in place by two companies of the Nigerian Battalion (NIBATT). At the same time the QRC was airlifted by two waves of three Mi-8s each to Area 3 Bridges. At 0738hrs, the Kailahun companies linked up with 2 PARA (SF) and began moving towards Giehun with 2 PARA pulling rearguard duty and taking care of snipers along the way. Around 0930hrs, Indian Mi-35s had arrived to provide security for the column. At 0945hrs, 18 Grenadiers of INDBATT-2 were airlifted to a position northeast of Giehun and awaited the arrival of the Kailahun column, linking up with them by 1030hrs. The column then entered the town. One hour later a company from the Kailahun column was airlifted to Daru. By 1230hrs the Daru column of 5/8GR linked up with the QRC at Area 3 Bridges, having fought through the towns of Bewabu and Kuiva, and prepared to attack the town of Pendembu. The town was the headquarters of the RUF number 1 Brigade and a tough battle was expected. An Mi-35 initiated the attack with a precise attack against known RUF positions inside the city. Mech-2 then moved through the town and occupied the northern section of Pendembu while Mot-2 systematically began searching houses. Several fire fights broke out, with the RUF forces taking all the casualties. With the town secure, a column was sent through the jungle and linked up with the remaining forces of the Kailahun column, which was then escorted into Pendembu, arriving at 1900hrs. Beginning at 0815hrs on the 16th of July, IAF Mi-8s began airlifting 2 PARA (SF) and INBATT-2 (minus D Company) to Daru. While the airlift was still ongoing, an Mi-35 engaged RUF forces north of Pendembu which were advancing on the town. By 1030hrs the last of 12 sorties by the Mi-8s were complete. 5/8GR along with the QRC (minus two platoons) departed Pendembu with Mot-2 in the lead. Mech-2 remained to the north to provide security, with one Mi-35 providing cover. On the return trip to Daru the column encountered ambushes along the way, with two taking place at 1430hrs. Mot-2 at the head of the column was ambushed outside of Bewabu while INDBATT-2 was hit outside of Kuiva. A vehicle carrying ammunition at the second ambush site was hit by an RPG, destroying it, and a Chetak helicopter was brought in to pick up the casualty. At 1730hrs the column reached Daru, concluding this successful operation, that provided a boost for both the Indian Army and UNAMSIL forces. The practice of take-the-fight-to-them involves extensive aerial reconnaissance followed by para-dropping operators into the target area. These missions continue for weeks at a stretch and include raids on terrorist camps and ambushes along infiltration routes.